The backlit silhouette of a lone female figure appears centrestage in a voluminous skirt of billowing waves. A soft light shines on her face as the sound of a turbulent current escalates around her and we are introduced, via recorded voiceover, to the Djurra Dreaming narrative of the Bundjalung nation of north-eastern NSW, of the mother summoning her sons from the sea, to the shore, to her, for she is also the headland. This arresting image is immediately followed by the entrance of the three sons sliding on their backs to emulate the watery expanse from which they’ve come. The brothers, dancing with sticks which are at once paddles and subsequently spears, are depicted as archetypal men of the Dreaming. Featured solos set them apart as individual characters, while also serving to subtly shift us from the Dreaming into the here and now. A chair is placed on stage and the woman (Sarah Bolt) is reintroduced as a frail patient in aged care. We discover the three men are also her sons, who will also return, as her death is imminent. Director Kirk Page’s Djurra is important for so many reasons, first and foremost as a multi-disciplinary performative ceremony including dance, spoken text and physical theatre in which ritual is enacted. On opening night Djurra is framed by coinciding events, the first of which is a large-scale sand painting created by local artist Digby Moran. The mandala’s repetitious squares within squares act as a meditation, gently guiding the observer to quiet contemplation. Immediately preceding the performance, at the base of the steps of the Lismore City Hall a large crowd gathers to witness a performance by local Indigenous girls’ dance group Nini Ngari-Gali, organised by Sarah Bolt through NORPA . This is followed by a Welcome to Country ceremony in English and in Bundjalung Widjabul language given by Roy Gordon, who along with Rhoda Roberts is one of the cultural consultants on the production. One of the speakers was from a group of weavers commissioned to respond to the Djurra Dreaming history by creating a collection of traditionally woven artifacts installed in the foyer directly opposite the entrance to the theatre. By the time we take our seats we have unwittingly processioned to our modern day dance ground. Edward Horne’s set is spare, uncluttered, rendering the stage space flexible. Two large woven mats hang as textured curtains upstage, utilised as vertical projection surfaces on either side. The large horizontal space between also serves as a projection surface, creating a triptych effect with images softened around the edges like floating thought bubbles. A large roving platform is manipulated by the cast to emphasise distance, from one continent to another, from one state, one room or one bed to another, while also serving as the mother’s eventual deathbed — the exposed innersprings of a mattress, suspended directly above, appear to emulate that in-between space otherwise known as purgatory. This deathbed image is augmented by a captivating dance momentarily taking us out of the narrative. Performed by Joel Bray it begins on the floor, gradually ascending through deft harness work. Bray embodies the spirit through a series of circular movements growing ever more expansive, from smaller sequential isolations, progressing to floor rolls, graduating to larger and larger leaps until he eventually takes flight, eschewing his (and presumably the woman’s) mortal body. In an earlier scene, the eldest brother played by Damion Hunter, introduces the harness by emulating the whirligig motion of a helicopter’s rotating blades. 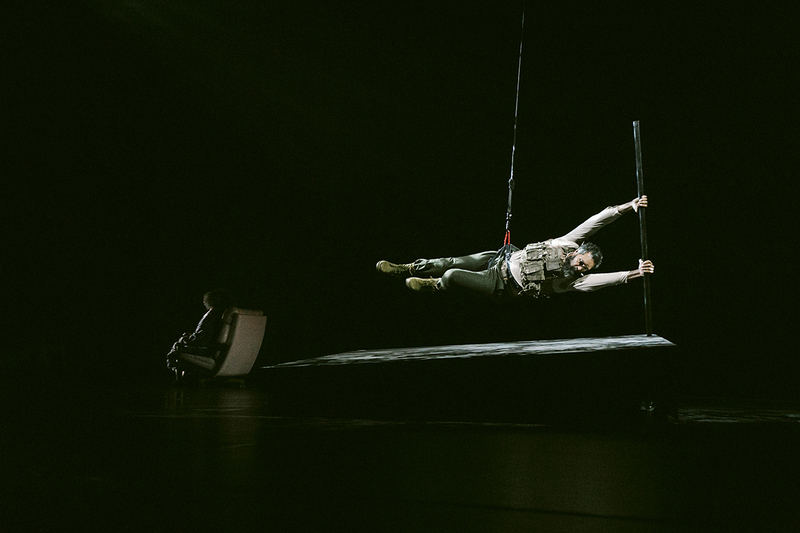 By holding onto a short pole attached to the floating platform while directly addressing the audience, Hunter succinctly embodies the precarious dangers of combat his character has left behind. This transcendental approach is extended to the execution of text, to varying degrees. Not quite abstract nor surreal but not entirely literal, the text was subtly stylised in places, notably by James Slee who plays the youngest brother, who has never ventured far from his childhood roots. With an obvious hip hop background Slee includes the odd quick alliterative analogy accompanied by equally subtle changes in a rhythmic delivery indicative of rap. In Bray’s first soliloquy I recognise substantial autobiographical elements meshed into his onstage persona as the middle brother who has purposefully distanced himself from, yet is staunchly proud of his familial origins — evidence that the text has been developed through a collaborative devising process. In another of Bray’s soliloquies — delivered after his mother’s funeral and about men and mourning and upholding a code of male stoicism — I witness something deeply poignant followed by a sense of missed opportunity. This brief scene is framed by a ritual of funereal preparation performed in unison, of shaving, combing and donning the multi-purpose suit jackets that in this instance serve to speak of solemn resignation. It’s followed by Bray’s reminiscence of his mother’s description of a cry. His physiological recollection of a lament as consisting of five short inhalations followed by a long exhalation as having the inverse properties of a laugh — five short exhalations and a long inhalation — so succinctly describes the way in which men are programed to compartmentalise emotion and distance themselves from attachment. As one of the most universally topical issues, this beat is over all too soon. Djurra’s text doesn’t preach declarative fact at the audience, telling them what it is to be Aboriginal in any generalised sense. Rather, its potential strength lies in its revealing the Blackfella condition through character content, through circumstance. For Bray, it’s what it is to be a white Blackfella when having to explain his race to each person he meets while travelling abroad. For Slee it’s the significance of staying on country and maintaining kin connections, and for Hunter it’s the obligation to share personal wealth with community while secretly paying for his mother and brother’s upkeep while he’s on tour in the armed forces. 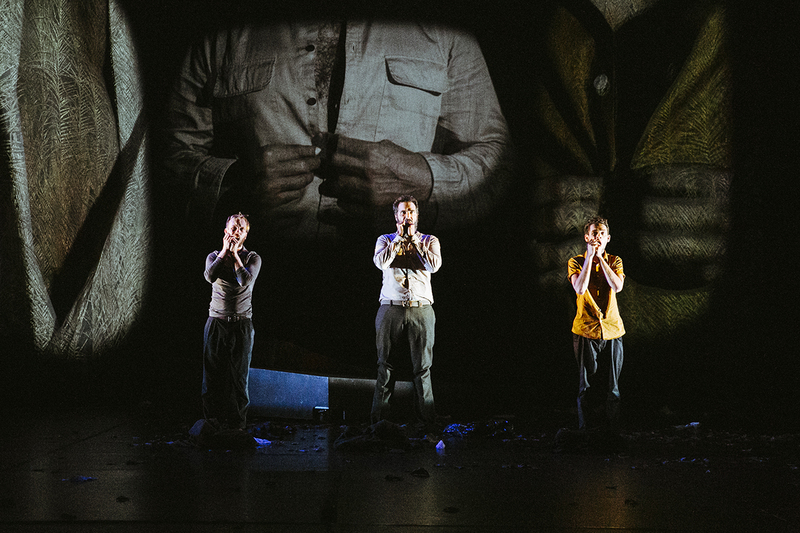 The text became problematic where it felt simply under-rehearsed or broken in mid-sentence, forcing the audience to work harder than it needed to stay on track and when its delivery was not sufficiently well modulated to get a sense of the work’s dramaturgical arc, ultimately compromising levels of intimacy and audience access. This could also be said of transitions between scenes, which were at times slow and clunky. As an actor in the inaugural Black Playwrights Conference of January 1987, I can attest that even this raw state Djurra is testimony that we have come a long way from the early days where we were trying to establish an Indigenous vernacular within mainstream theatre. 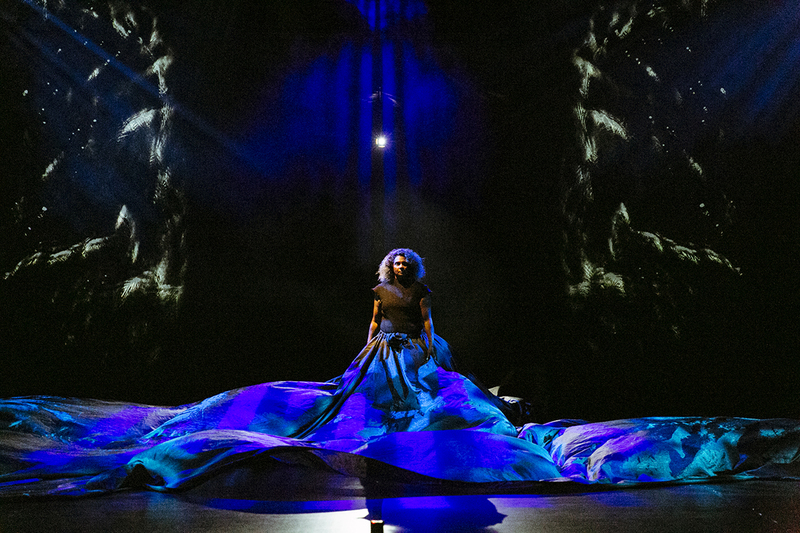 The use of parallel narratives is becoming a more widespread technique, illustrating the element of embodiment, of actually ‘becoming’ in order to access the Dreaming and using the theatrical space to sing those histories alive as seen in Bangarra Dance Theatre’s Bennelong which features a vignette where all of the male performers declare, “I am Bennelong. 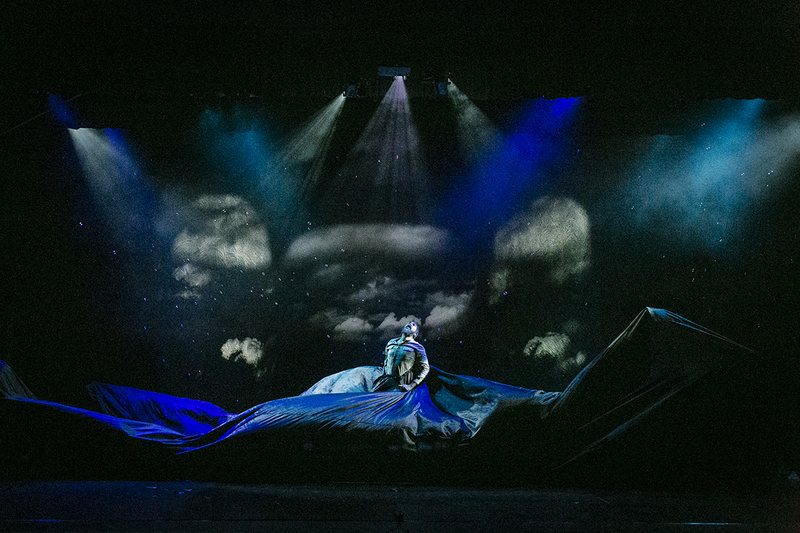 Kirk Page’s strength as a director lies in his physical performance history and the inclusion of the harness work, aided by the continuity provided by Jade Dewi’s choreographic hand. Video artist Rohan Langford consolidated images rather than introducing new information, while at low levels, Karl Johnson’s lighting provided an atmospheric quality to the Dreaming scenes, in juxtaposition with the present day narrative, which was imbued with a bright clarity of the everyday. Composer Ben Walsh was also able to work across a broad emotive range without overpowering the work, lending an almost cinematic structure in the versatility of sound the work demanded. I feel this short season is not the end for this production. It would be good to see the actors given the chance to truly inhabit Djurra and for the production to continue to evolve. Read an interview with director, Kirk Page about the making of Djurra. Independent choreographer, performance‐maker and teacher, Vicki Van Hout is a Wiradjuri woman born on the south coast of NSW. Vicki travelled to Lismore courtesy of NORPA.